Gorgeous, Move-in ready 2 bedroom, 2 bathroom condo for sale in the serene Brighton II at Terra Vista community!! This condo is immaculate and ready for you to move right in. The owners have recently installed brand new, top of the line, "pet proof" carpet and the most beautiful wood laminate flooring in the kitchen and bathrooms. In addition, they have replaced the appliances with clean and modern stainless steel. All appliances are included, including the refrigerator and stackable washer and dryer. The granite counter tops compliment the cabinetry and the newly installed flooring. The master bedroom features an en suite bathroom, walk-in closet and private balcony. This unit is a corner unit with 2 balconies and direct access to the 2 car garage. It is light and bright and private. 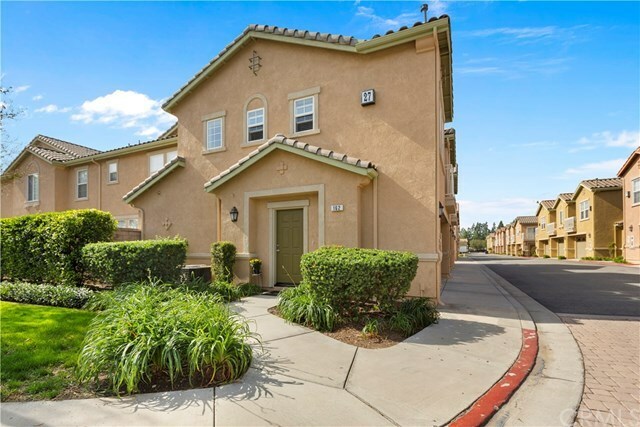 This community features an inviting pool area with lounge chairs, children's playground, BBQ and picnic area AND one of the lowest HOA dues in Rancho Cucamonga (paid water bill is included). Close to shopping and dining and transportation. Make your appointment to see this unit. You will not be disappointed!! Directions: corner of Milliken and Church, 1st building on your left when you enter the development.